NEW! If you just want to ask a quick question, you can use the DarkIRC Java Applet to connect to #gloom IRC. Simply choose "Connect" and press the "Join Channel" button and select #gloom. Note, you will need to click "Yes" to accept the network permissions (otherwise you can't connect! 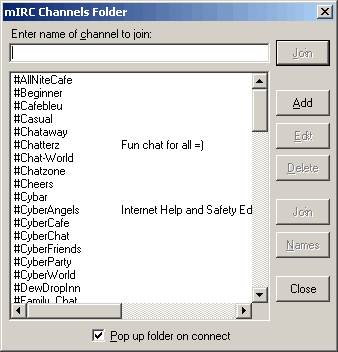 To get started chatting in real-time with other gloomers and catch the most up to date discussions, you will need an IRC client. This is a program that connects to a server with other users. 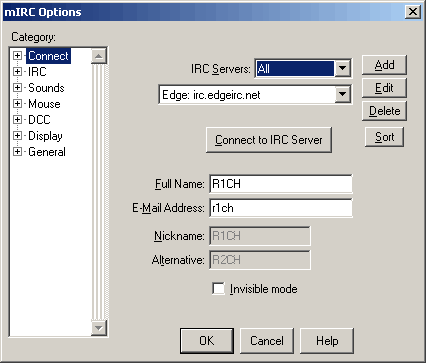 The most popular and probably easiest IRC client for Windows is mIRC, available at http://www.mirc.co.uk/. 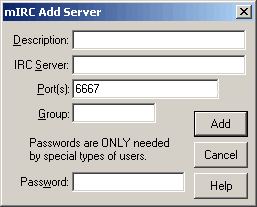 Once you have downloaded mIRC, look at the configuration section below. You will need to tell mIRC where to find the gloom chat server. Upon running mIRC for the first time, you should get a pop-up dialog box with a list of servers, as show in the picture to the right. In the description box, enter Gloom Chat. In the IRC Server box, enter irc.planetgloom.com. The rest you can leave as it is. Hit the Add button, and you should be returned to the options screen to the right, with the Gloom Chat server selected. ...simply hit the button, and you will be connected to the gloom chat server. Once you are connected, another dialog box will pop up asking you which channels you want to join. It should look something similar to the one pictured to the right. The big area is where the chat text is displayed. 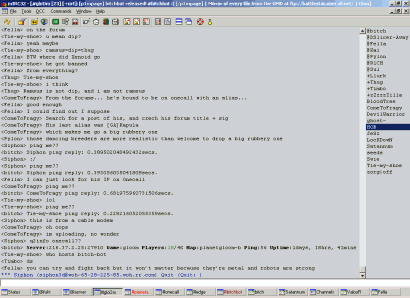 The colum on the right is the nickname list, everyone who is in the chat room is shown here. The small one-line white area at the bottom is where you enter your message, followed by enter to send.